(Reuters) - U.S. Secretary of State Mike Pompeo said on Wednesday that Turkish President Tayyip Erdogan had made clear in talks in Ankara that Saudi officials were cooperating with Turkey's investigation into missing journalist Jamal Khashoggi. 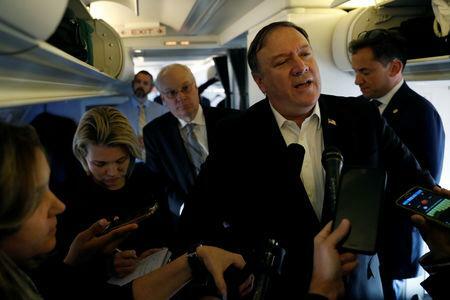 "He made clear that the Saudis had cooperated with the investigation that the Turks are engaged in and that they're going to share information that they learn with the Saudis as well," Pompeo told reporters aboard his plan after left Turkey. "There have been a couple of delays but they seemed pretty confident that the Saudis would permit them to do the things they need to do to complete their thorough and complete investigation," he said.